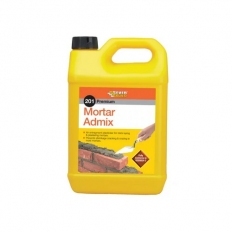 Mortar Admix is a plasticiser that replaces lime in the mix and provides an easy-to-work butter-like consistency to the mortar. It also prevents shrinkage, cracking and crazing during the setting process. For use in brick laying and plastering mortars. Also provides a degree of frost resistance and freeze-thaw cycles.